In the first part of The Edible Woman we meet Marian, a self-reliant, educated, modern woman (for the 60s/70s), who spends her days as a manipulator of words and the consumer, in her position at a market research firm. Despite these things, Marian is also an amiable and even yellow-bellied narrator who stretches herself to the limits in order to please the likes of her boss, her friends, her roommate, her landlady, and her boyfriend, a promising young lawyer with a suffocating fear of marriage and commitment. Seemingly, right from the start, she is a woman in battle with herself and, silently, with those ravenous others around her, to find her true self. By Part II, the narrative of the novel shifts and the story is no longer told from Marian’s perspective, but instead from the third-person. Affectively, Atwood has us understand on a deeper level that our heroin is losing her identity, being devoured by those around her, and unraveling right before our very eyes. While we are observing the breakdown of Marian’s psyche, her autonomy, and her ability to eat, first meat, then eggs, then vegetables, she is preparing to marry her previously frightened but now enlightened, predatory fiancé, Peter. At this time Marian finds she’s drawn to Duncan, a young graduate student who appears to be the polar opposite of Peter. Although not as emotionally draining and demanding as Peter, like most men in this novel he still has a predominant neediness to him. The difference with Duncan being that Marian at times also needs him, and is not afraid to ask when she does. 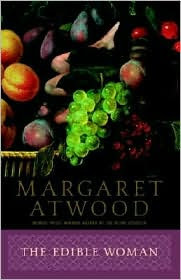 The Edible Woman is a stylistic tour-de-force, and although this is Atwood’s first novel, her metaphorical talents are found on every page. The characters behave strangely, almost whacky at times, but the messages are clear and important. Gender roles were at a shift when she wrote this novel, so I can imagine that it must have had a profound impact on the thoughts and feelings of women trying to find their place in the new and improved world. In this regard, all though women have been vacillating between their roles as caregiver and individual less in recent years, there is a timeless struggle-for-self apparent on these pages, that even today’s woman can’t help but relate to. In the end, I’m amazed by a heroine that can have me revolted and ready to scream at her spinelessness at one moment, and then vigorously dazzled, while I rally behind her strength of character, at the next. Great Review! Said a lot of stuff I thought. I've been meaning to come by, but have been busy with life (I hate when it interfers with my reading!). Anyways I think so far, my favourite Atwood novel is either Handmaids Tale or Oryx and Crake, I can't decide.